At the end of July at the IPEC production site the technological waste-to-energy facility based on pyrolysis plant TDP-2-200 and microturbine power station Capstone passed the first test. This is the initial phase of the project on creation of a free-running generator to produce electricity from organic waste. Despite the fact that the pilot-scale installation was launched for the first time, it was decided to test the raw material in the presence of a potential customer. 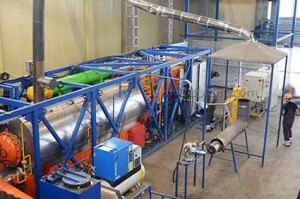 The test was carried out at modified pyrolysis plant TDP-2-200. Waste feed and discharge units are enclosed in a module of 40’ ft. container. This unique solution provides a high level of prefabrication of equipment that allows the installation work to be carried out as soon as possible, and greatly facilitates the process of TDP transporting. Chicken manure became a feedstock for testing. It is dangerous enough, but at the same time, high-calorific and concentrated organic waste type. That is why various WTE technologies of manure treating has been developing and testing worldwide, the most promising of which make it possible to extract the secondary resource from this waste — heat and electricity. The full batch load of raw materials weighing up to 200 kg was carried out. 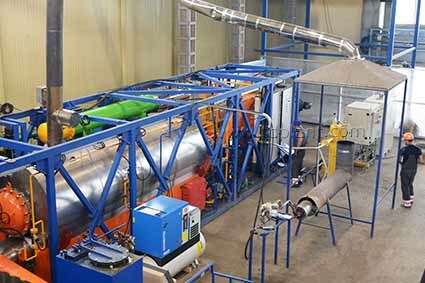 The pyrolysis gas obtained during successful processing of waste was sent to the microturbine power plant. As a result, it’s managed to reach the maximum score for the generation of electric power at Capstone C30 system — 32KW/h. The solids left after pyrolysis process was sent for laboratory studies.